Massive Pwnage will be taking Christmas off again this year, so there won’t be any new updates until next Wednesday. That will, of course, allow Locke and I more time to enjoy the holidays while you all should be doing the same! Have a good week everybody and see you all next Wednesday! 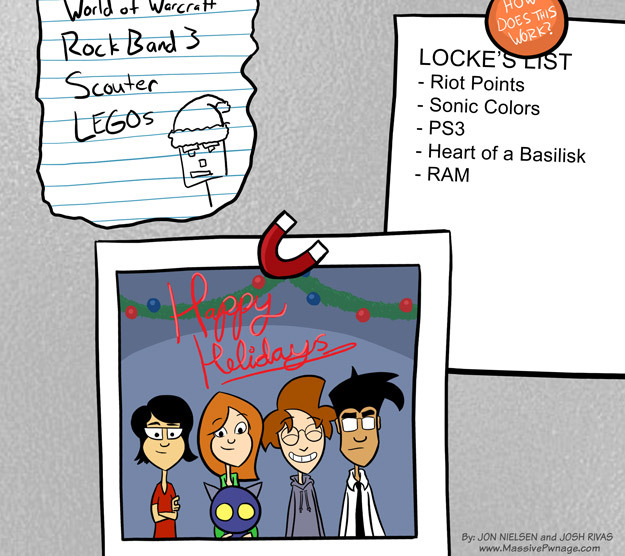 This entry was posted on Wednesday, December 22nd, 2010 at 12:00 am and is filed under Comics. You can follow any responses to this entry through the RSS 2.0 feed. Both comments and pings are currently closed. Look up the definition of Meme, please. It’s not exclusive to “4channers” as you call them. Memes are widely understood, so most people understand or know about it. RIIIIIIIIIIIIIIIIOT POINTS!!!!! GIMME DAT CHRISTMAS SKIN! Merry Christmas to all, and happy new year. Gee gee guiz. I should have asked for Riot Points. I just spent all of my IP on runes. Oh dear, you as well? I’m always short on IP, runes just cost so much. I ended up with plenty of extra cash this Christmas,so I was able to blow $20 on RP.I was saving up IP for Vlad,but I used my RP to get him and the Gentleman Cho’Gath skin,and spent my IP on runes for Vlad.Replacing all my old useless mana runes. Be sure to get DDR3. 4GB if you’re running XP. 8GB for 7. =O it can’t be over, i clicked next and it wouldn’t go T__T I been home from college, and needed something to keep me busy. I found your comic and just sat here reading for like the past two days, and i guess i caught up =(. what do i do now?!?!?!?! anyways, I love your comic, it’s pretty random. Much love for the LoL references, especially that teemo and garen one XD. Looking forward to seeing what the future holds. Dont tell me there is only going to be one comic a week. Sorry Ultimatuim, Ence worked really hard to get this system working. A single change won’t happen on a whim, we’re both pretty busy trying to keep things running as it is. Also,changing something on this site is like pulling a dish from the bottom of the pile.